I'm a massive glitter addict, so this is one of my favourite necklaces! 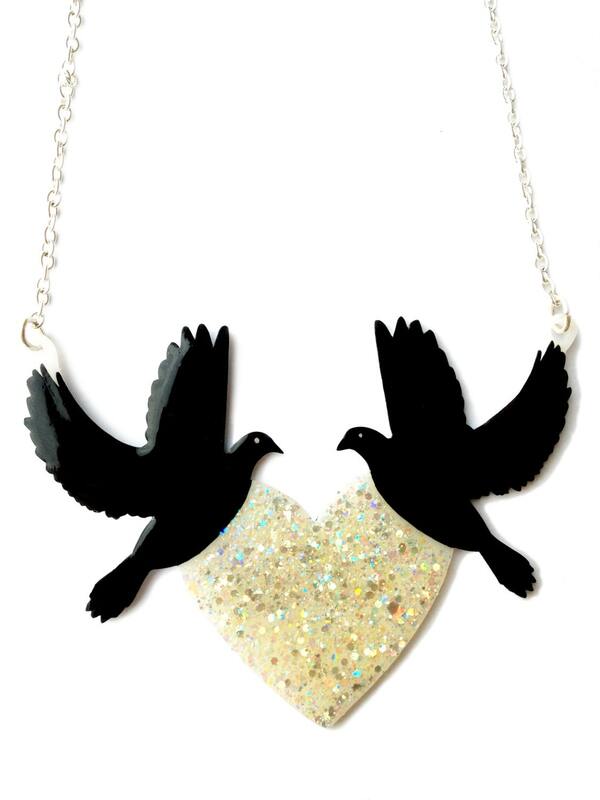 Two black birds fly above a beautiful white iridescent glittery heart. The heart consists of four different types of glitter... large holographic shiny rainbow shards and pretty opal pastel rainbow sparkles... I've tried to show in the photos but it just has to be seen to be believed! This is sure to make an impact and gather compliments wherever you go. Approx 8cm wide, 6cm long, however as each piece is hand made and drawn just for you, sizes may vary very slightly. Your birds with heart will be hung from a 16" silver plated trace chain, with a 2" extension chain.